The weather system that wreaked havoc on western Alberta on Tuesday has pushed farther east, with snowfall warnings currently in effect only for three southeast Alberta regions. 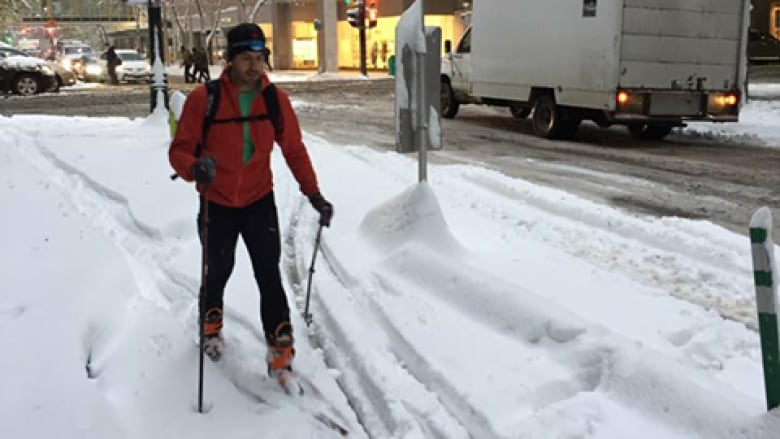 Calgary is cleaning up after Tuesday's unseasonably harsh taste of winter. The early fall snowstorm broke two of the city's weather records. Environment Canada said the 32.8 centimetres of snow that fell in Calgary on Tuesday shattered the Oct. 2 snowfall record of 4.6 centimetres set in 1954. The snow also broke the one-day record for snowfall in October, which was 30 centimetres, set in 1914. But Calgary got off comparatively light as both Kananaskis and the hamlet of Bragg Creek west of Calgary saw 60 centimetres fall as of 7 p.m. MT, while the hamlet of Exshaw had 48 centimetres of snow as of 9 p.m., according to Environment Canada. The city called for help from surrounding communities — trucks and crews came in from Edmonton, Red Deer, Okotoks and Medicine Hat — which made for a much smoother commute for drivers. In a release Wednesday morning, the city said 59 sanders and 22 graders with crews were on the roads preparing for the morning commute, and 40 pieces of equipment from "municipal partners" were added to help. Troy McLeod, the director of roads, said crews finished clearing the major routes, known as Priority 1 routes to the city, and had already moved on to Priority 2s. A 72-hour snow route parking ban went into effect at 10 a.m. to help with those efforts, which McLeod said has a good possibility of ending early. He said they hope to get to Priority 3 and 4 routes in the next few days. The clearer roads made a big difference when it came to driver safety in Calgary. Acting Sgt. Quentin Blindenbach with the Calgary Police Service said of the nearly 350 crashes reported during the snowfall, three-quarters of the calls came Tuesday morning. Tuesday was also a hectic day for Calgary Transit drivers and commuters, as about 80 buses get stuck in snowbanks around the city and many had trouble navigating slippery hills. Doug Morgan, director of the transit department said things were Wednesday were better and running more in-line with typical winter days. "Today is a much better day," Morgan said. "I would call today a challenging day, but very conventional when it comes to winter operations." Most of the bus route detours put in place during the storm have now been cancelled. Only routes 1, 6, 17, 26, 76, 113 and 299 are still being re-routed. Morgan said the C-Train was running with no delays. Highways across the province that were shut down Tuesday because of road conditions and crashes have all reopened. In some areas, cars were parked for hours on impassable highways. Alberta 511 is still warning of delays due to the volume of traffic trying to get through the re-opened routes.